We are always looking for new members. Have you considered singing in a choir, but not done anything about it? Do you sing around the house? Do you sing along to the radio? If you do, then we want to hear from you, regardless of your musical experience or singing ability. However, you do need to be at least 18 years old. No problem. A lot of members have learnt the basics of reading music during their time in the choir and there will always be someone experienced to help you. No problem. Choral singing is about everyone blending in together to create an even sound. Your confidence will grow naturally with experience. How will I know in which section to sing? Although there is no formal audition to join the choir, the Musical Director will need to hear you sing to assess your vocal range and to ensure your ability to hear and sing notes correctly. He will then suggest that you join the section of the choir which should suit your voice range. Of course, it's not just about the music. A choir is a social gathering, a source of camaraderie and friendship. Not only can you make lots of new friends, you might even bump into old friends you haven't seen for a long time! 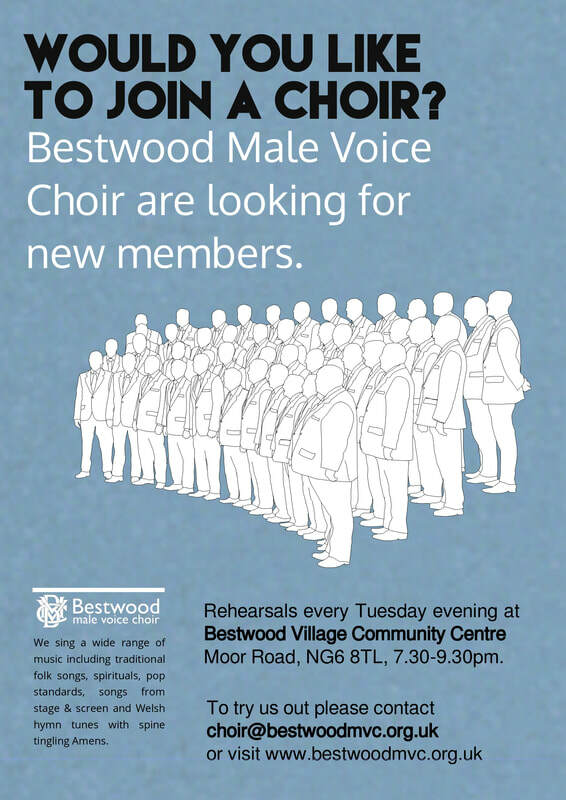 If you would like more information about joining the Bestwood Male Voice Choir, please contact Colin Pursglove (0115 979 4842) or e-mail choir@bestwoodmvc.org.uk. See you soon. You won’t regret it!